Owning an Everglades Center Console is an exceptional experience. 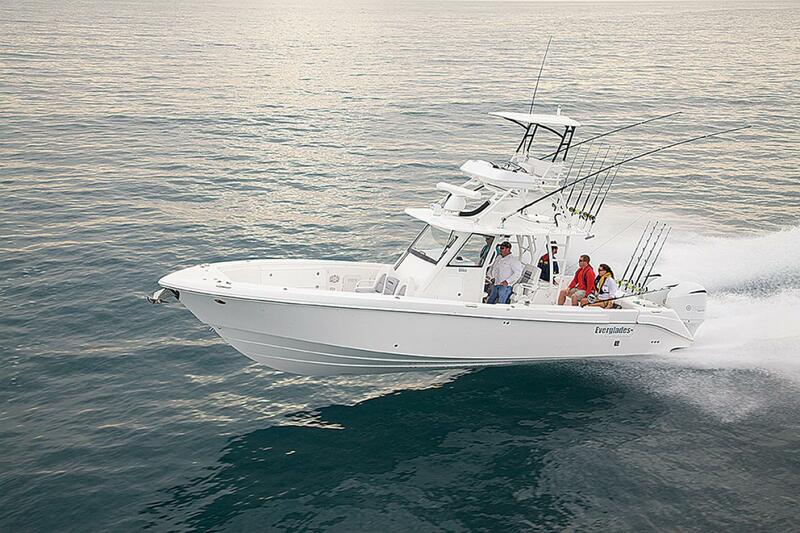 Unsinkable build and upscale details make this luxury fishing boat a pleasure to own. How can you make sure that your investment is well-protected? Here is an outline of recommended Everglades boat maintenance coming direct from the factory. After using your boat, always wash the exterior with boat soap and fresh water. Wipe down all surfaces with a soft cloth to eliminate water spots. Flush motor/generator with fresh water. NOTE: never directly spray motors, components or electrical wiring! Wax and polish all stainless steel parts. Check and grease all seals in access hatches/deck plates. Wax hull with fiberglass wax. Wax all powder coat parts. Add fuel stabilizer if storing vessel for more than seven days. Refer to engine manufacturer for maintenance schedule. Cycle all ball valves open/closed to ensure working condition. Check and/or clean battery post connections. Inspect and check connections on batteries. Inspect all hoses to check for leaks or faults. Inspect props and lower units for damage or excessive wear. Inspect waste system for correct operation. It is recommended that you wash and wax all exposed fiberglass surfaces at least four times a year. This helps to extend the life of the gel coat finish. Never use the windshield wiper if the windshield is not wet. Dried salt or dirt on the windshield can scratch the glass. Never apply wax or buffing compound to a gel coat surface in direct sunlight. Never use any polish containing lemon or lemon scents on vinyl. The lemon juice will attack the vinyl and cause it to deteriorate. Avoid getting sun tan oil, lotions, waxes and polishes that contain oils and dyes. These can cause stiffening and staining of vinyls. Following these maintenance tips can help keep your Everglades center console luxury fishing boat in tip-top shape for many years to come. InterMarine’s Service Department can help take care of ANY and ALL of these maintenance steps for you if you prefer to just set your boat in the water and go play. Call our Service Department to book an appointment.